Motion Pro Vision action camera hd sports helmet cam. We offer one camera model - the Vision. This is an all-purpose camera suitable for both action and non-action use. It differs from other action cameras on the market in that it has a narrower lens angle. For a general purpose camera we think a narrower wide angle lens is prefereable to the super wide angle fisheye lens used by most other sports cam companies. There is less distortion at the edges of the image, and it concentrates more on what is in front of the camera. This makes it as suitable for filming people and scenery as it is for pure action use. You can read more about our action camera lens here. The sports camcorder uses a Sony IMX179 imaging sensor. Sony's third generation Exmor R™ back illuminated sensor realises higher picture quality and nearly twofold sensitivity over earlier sensors. The colour balance and exposure work well with the out of the box settings. The sensor is used in many smart phones and tablets, and is known as one of the best in its class. It produces video with high bitrate, and has a 60 frames per second mode at 1080P for smooth slow motion effects. You may view sample films and photos to check the quality before you buy the camera. It is equivalent to around 15mm lens in 35mm film photography. This is already wide angle, and wider than the common 28mm lens found in most film SLRs at their widest setting. The fisheye 170 degree lens causes distortion to the edges of the picture, where straight lines become curved. The narrower lens removes much of this distortion. This may not be important for pure sports use, but for general purpose filming and photos we prefer a more linear appearance. The all-around sports camcorder is used for filming people and scenery as much as pure action. With fisheye lenses steep slopes are distorted making them look flatter than in real life. For example if you are skiing and there are mountains in the background it is important that the slopes to look steep. A narrower lens preserves the steepness of slopes and terrain features, so when you get home the footage looks similar to what you remember. For mountain biking where you are following another rider down a trail, you want to see more of the rider in front of you. The sides of the trail and immediate foreground are less important. A narrower lens concentrates on the area of interest in front of the rider, whilst maintaining size and steepness of the trail features. For drones and aerial photography where the drone cam is a long way from the ground a more zoomed in view is preferable for many people. It reduces the distorted curvature of the horizon to give a more natural view. Lens angle is a personal preference. The Vision uses a narrower lens, making it an all-purpose camcorder suitable for both action and non-action use. There is a colourful, bright LCD screen across the back. This is your viewfinder and lets you preview the image. You can also playback images and check they have come out well whilst still on location. It gives you access to the menu system for using the features of the model. The screen automatically switches off when recording to save battery life. Easy access slow motion mode. Burst mode photos up to 10 per second. Included with the helmet cam is a WiFi remote control. This is convenient for controlling the headcam when it is mounted to your helmet, or anywhere else where you cannot reach it easily. It has two buttons, one to start and stop recording and the other to take a photo. You can strap the remote control to your handlebar or wrist using the velcro straps included in the kit. You can also control the camcorder and view the video remotely with an Android smartphone or tablet using the WiFi mode. This is useful if it is mounted to a drone, or somewhere inaccessible and you want to preview the picture to check the image angle. The kit includes many mounts and accessories for a wide range of applications. The waterproof case comes with two backs - one is waterproof and the other has openings to let the sound inside. The waterproof case is compatible with the GoPro™ mounting system. 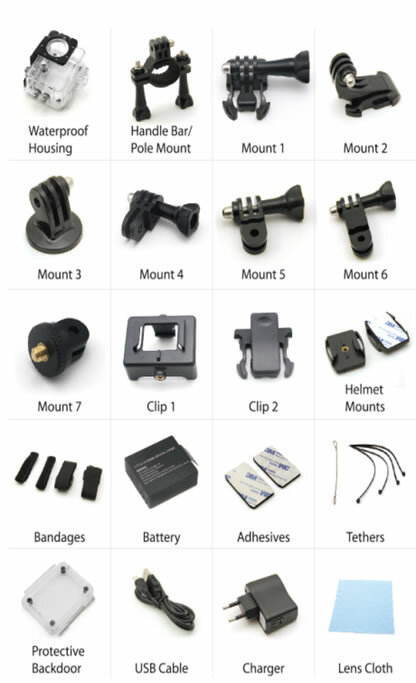 Many other mounts and accessories are available if we do not include the one you need. See the full list of included sports cam accessories here. 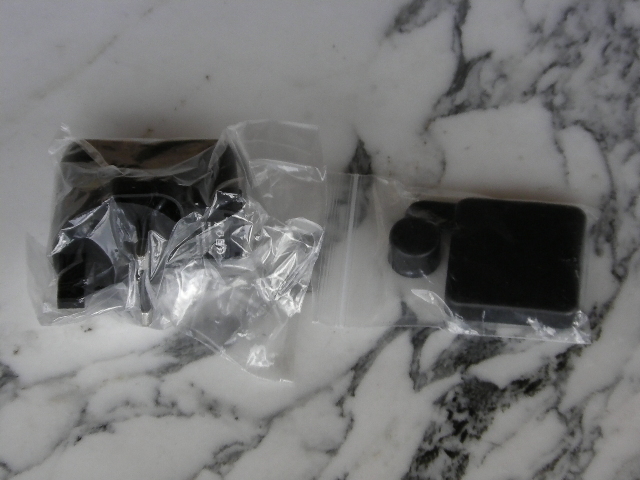 It also comes with protective lens caps for the body and waterproof case as standard. Please note the camera is not compatible with Apple Mac computers or Apple iPhones and iPads (connects to Windows computers only). The price is £34.99 plus VAT (£41.99 total) with free UK Signed For delivery. Output Micro USB, Mini HDMI. 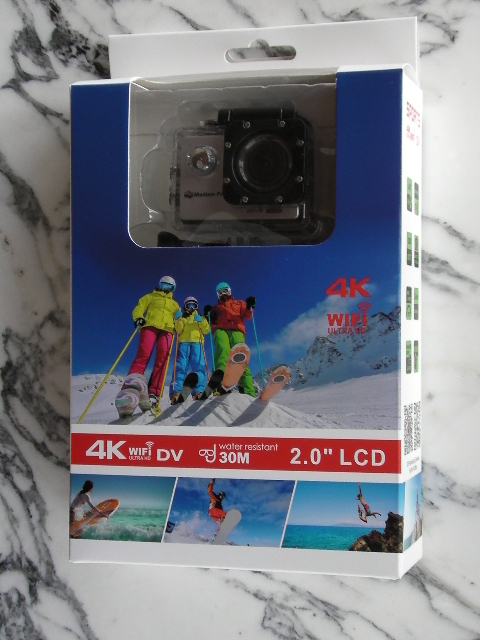 Please note: The actioncam is supplied in generic packaging. The information written on the packaging may be different to the actual specification. The specification is subject to change without notice.